Pugs are adorable. I Love Pugs was created because of a fascination about this incredibly cute breed of dog. Many people believe that if you want to have a constant source of love and affection in your life you should get a dog. We think that dog should be a Pug! Pugs take the companionship and loyalty traits to the highest degree we have ever seen in a dog. In fact, if you read just a little of their history, you’ll find this loyalty and their constant need to be with their owner one of the principal reasons they quickly became a favorite of the upper classes of society. From the monks in Tibet more than two thousand years ago to the Royal Families in Europe during the 1600’s, the Pug became a big favorite. Pugs eventually made their way to America and have been in the top 20 most popular breed list on a consistent basis. In many cities and urban areas Pugs are in the top 10. The American Kennel Club recognized the Pug as an official breed in 1885 and they have more a couple of winners of the coveted Best in Show award at the Westminster Show in New York City. We've covered all the characteristics of the Pug Breed here on this site. We created I Love Pugs after our son and daughter in law got a Pug. It is hard not to be impressed with this breed of dog. They are intelligent and can be trained fairly easily. They love to be the center of attention and they will follow their owners around constantly. They seem to love human companionship better than being with other dogs! Pugs have great personalities. And they love to eat! Pugs are an eating machine. Throughout the I Love Pugs site there is a lot of information dealing with the health and care of a Pug. Diet and food food is a very important topic. If left to their own devices, a Pug would eat all the time. You can end up with a very pudgy pooch. Being overweight is one of the most common health problems in a Pug (just another reason to love them!). Because of their short face, which can make them more prone to breathing problems, an owner should be careful about their dog’s weight. At the I Love Pugs site we cover all of this and more. There is information on what to look for in a breeder and veterinarian. We also have information on grooming and general care. If you’re interested in showing your dog or entering into a competitive activity we also have information on that. You’ll want to investigate advanced dog training as well as information on the Canine Good Citizen Program sponsored by the American Kennel Club. Did you know there are extensive dance activities for Pugs? We didn’t. One of the great things in creating I Love Pugs has been everything that we have learned and continue to find out about this adorable breed of dog. We also found out that, like everything else in life, Pugs are not perfect. They have one fault that every prospective owner should be aware of: Pugs shed. They shed a lot. If that is going to be a problem it’s better that you know about that up front. We also found about an incredible group of people throughout the United States and the world. There are some very dedicated volunteers who run Pug Rescue groups in almost every area of the country. We salute these people and the great work that they do. If you’re a Pug lover and are looking for ways to make a difference in this world, one of the Pug Rescue groups we list would love to have your support. We admit that we may be slightly biased but we do think that Pugs are an incredibly cute breed of dog. They even make great toys. They're just incredibly cute dogs. We've heard stories of many parents who have a child who has fallen in love with a Pug owned by somebody they visit. For some of them Pug ownership was not an option so they did the next best thing and bought their child a stuffed Pug. We have heard many stories like that and if you have one of those please let us know. I Love Pugs is dedicated to bringing quality information to other Pug lovers. 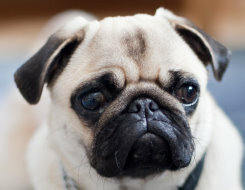 You’ll notice the dashes in the official website name which is I-Love-Pugs.com. It reminds us of a story about someone who noticed that on every tombstone they listed the birth year and death year with a dash in the middle (like 1809-1865). They noted that it wasn’t the years that were listed that were important, it was what happened in between. It was the dash! We like to think that applies to I-Love-Pugs.com. It’s not just the fact that the site mentions the word Pugs – it’s the information that’s contained in its pages. It’s the dash! If you have topics you’d like to see here or have questions for us, please contact us at anytime. Enjoy your visit here! You probably found us because you feel exactly like we do: I Love Pugs!